A local pet rescue organization challenged a recent Board of Zoning Appeals decision in court, asking a judge to take a look at the ruling that could determine the existence of the Perfect Paws Pet Rescue. On Oct. 15, the Allen County Board of Zoning Appeals denied an August petition by the pet rescue for a special use permission by a 4-0 vote. The ruling came after a public hearing in which surrounding landowners and concerned citizens presented evidence or submitted written statements. Open since 2006, Perfect Paws Pet Rescue is operated out of a Flutter Road property owned by Tammy Derickson and a friend. The group rehabilitates dogs and cats removed from shelters, helping them to become good pets. More than 175 dogs have been saved from Fort Wayne Animal Care and Control this year, Derickson argued at the time of the hearing. In October, at the time of the hearing, they had seven dogs – four Chihuahuas and three poodles. When they would take in foster dogs, never more than three at a time, all of the dogs would live in the house. But neighbors complained, according to court documents. Those neighbors included Allen County developer and Realtor Ric Zehr, who serves on the county’s regional sewer and water district. According to court documents, complaints included concerns about noise and property values. But many spoke in favor of the special use exception. The land is currently zoned A-1, which allows farming, livestock and riding arenas, according to court documents. The board found that granting Perfect Paws’ request would be “unduly detrimental to the surrounding area,” according to court documents. The attorney representing the rescue pointed out in the request for judicial review that there are two animal-centered commercial businesses within a mile of the rescue, both focusing on grooming, according to court documents. While the rescue has continued to operate in the month since the BZA’s decision, the act of fostering the dogs is done by other people now, Derickson said. “We are limited, unfortunately,” she said. Because Derickson was the only one to remove pit bull-type dogs from the Fort Wayne Animal Care and Control to foster them if an adoption was not immediately found, those dogs now remain in the shelter unless euthanized, she said. “It is very unfortunate,” she said in a telephone interˆ­view Monday. Support for the rescue has built in the weeks since the battle with the Board of Zoning Appeals became public, she said. Popcorn and pets — it’s set to be a Halloween movie date with a difference. Ireland’s only drive-in cinema has encouraged film fans to bring their pets to the movies next week as part of a special animal welfare initiative. Movie Junction, based in Carrigtwohill in East Cork, will host two days of special screenings with the proceeds going to help the Glansillagh Animal Rescue in Glanmire and the Community Cats Network in Midleton. The initiative also hopes to raise awareness about animal safety over the Halloween period. Animal rescues see a surge in demand around Halloween, with terrified pets fleeing their homes in fright over fireworks, and in some cases, dogs and cats suffering from firework-inflicted burns being presented. Movie Junction owner Ellie Redmond said they wanted to do something special to mark their fourth anniversary. “Animal rescues are under extra strain at this time of year so we hope to raise awareness of their outstanding work while also highlighting the extra need to keep pets indoors and away from fireworks and bonfires this Halloween,” she said. Barbara Bowles of Glansillagh Animal Rescue said they relied on donations from the public to help meet their annual €40,000 running costs. Tickets for the screen-ings are available online for €25, with €15 going to the animal welfare charities. A donation of €4 per car will be made for those who buy regular tickets for screenings of Disney’s Alexander and the Terrible Horrible, No Good, Very Bad Day, and Teenage Mutant Ninja Turtles on October 30, and for Alexander and new release The Book of Life on November 1. Whitney Clark plays tug-of-war with her pit bull mix Scarlett at their Berkeley apartment with boyfriend Chris Mortweet. Of the apartments that take pets, many have restrictions on breeds like pit bulls, such as Clark and Mortweet’s Scarlett. 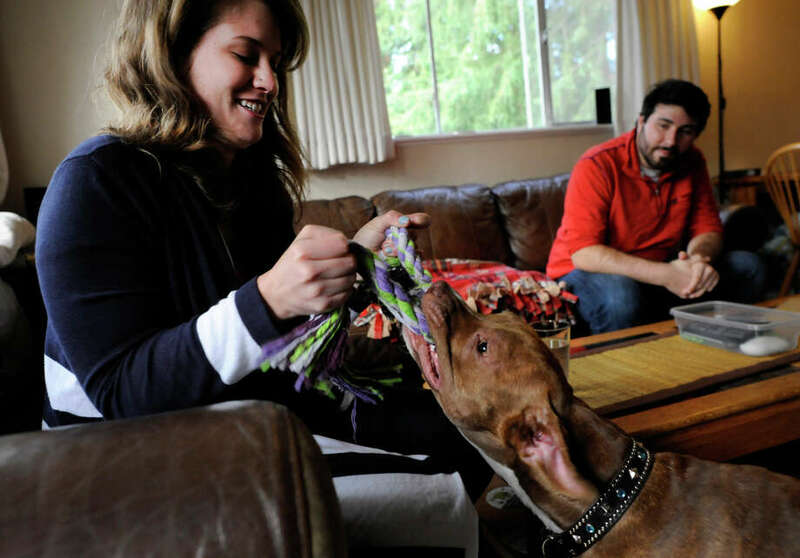 Whitney Clark holds a toy for her pit bull mix Scarlett as they play in their pet-friendly apartment in Berkeley. Clark, who has worked with dogs for years and has pet insurance, snuggles with Scarlett on their couch. Whitney Clark and her partner Chris Mortweet take their pit bull mix Scarlett for a walk around their neighborhood in Berkeley, CA, on Wednesday, Oct. 15, 2014. Whitney and Chris had a difficult time finding an new apartment in Berkeley that would accept them along with their dog Scarlett. Whitney Clark and her partner Chris Mortweet hang out with their pit bull mix Scarlett at their apartment in Berkeley, CA, on Wednesday, Oct. 15, 2014. Whitney Clark and her partner Chris Mortweet pose for a portrait while walking their pit bull mix Scarlett through their neighborhood in Berkeley, CA on Wednesday, Oct. 15, 2014. Whitney Clark and her pit bull mix Scarlett walk in the front door at their apartment after a walk around the neighborhood, in Berkeley, CA, on Wednesday, Oct. 15, 2014. Apartment hunters having an impossible time finding pet-friendly dwellings may want to set their sights on Berkeley, which is considering a first-of-its-kind law that would forbid landlords from imposing pet restrictions on tenants. City Councilman Jesse Arreguin wants landlords to accept everything from hamsters to Saint Bernards — so long as the pet can be reasonably accommodated, is well behaved and the tenant takes responsibility for property damage. State laws exist to grant exemptions from pet bans to tenants with physical or mental disabilities who rely on service animals or emotional-support animals, but Arreguin’s proposal would offer protection to all tenants and type of pets. Part of the problem, Arreguin said, is that landlords have complained about a “floodgate” of tenants claiming mental illnesses and the need for emotional-support pets. Such exemptions from pet bans confuse other tenants, Arreguin said. His proposal would provide “clarity and convenience” for both landlords and tenants, who would be required to disclose whether they have a pet. Additionally, Arreguin said, allowing tenants to keep pets would cut down on the city’s homeless pet population. Every month, several people surrender their dogs or cats at the city’s animal shelter because they can’t find landlords who accept them, officials there said. Landlords are less than thrilled about Arreguin’s proposal. Landlords have many good reasons to ban pets, he said. Chief among them is property damage. Dogs scratch up hardwood floors, cats claw up carpets and curtains, and sometimes the stench never goes away, he said. The damage often outstrips the tenant’s security deposit, and the landlord is left footing the bill, he said. Arreguin’s proposal allows landlords to evict tenants if they don’t keep the unit “in a sanitary manner,” if the pet is a danger to other tenants, or if the pet is causing significant damage. The proposal is believed to be the first in the state, according to housing industry groups. But its legality is murky. State law allows landlords to prohibit pets and to discriminate against certain kinds of pets, such as pit bulls. Arreguin’s staff said the proposal doesn’t contradict state law, it only expands it slightly — forcing landlords to provide the same accommodations to all pets that they are currently required to provide to service animals for the disabled. The council is slated to vote Tuesday on the issue but is likely to refer it to the housing and animal commissions for further review. In two or three months, it could return to the council for a full vote. For dog owners like Whitney Clark, such a law would be a godsend. Finding housing in Berkeley is difficult already, but with a dog — especially a pit bull, like she owns — it’s nearly impossible, she said. She and her boyfriend looked for four months before finding a landlord that would accept their 2-year-old pit bull, Scarlett. Berkeley already has one of the toughest rental markets in the state, with the average rent hovering near $3,000 a month, according to the website Rent Jungle. Of the 200 or so Berkeley rental listings on Craigslist spanning the past week, only 25 accepted dogs, and many of those were restricted to the landlord’s approval. Some of them were studios or small lofts that would accommodate only the smallest dogs. Kathy Parman, a Berkeley landlord, said she was concerned about tenants’ allergies. Once a unit has housed a dog or cat, it’s sometimes impossible to clean the unit enough for someone with allergies, especially if the unit has a carpet, she said. Clark and her boyfriend eventually found an apartment in Berkeley that would accept dogs, and they moved Sept. 1. They ended up paying hundreds more than they budgeted, but getting to bring their dog Scarlett was worth it, she said. RICHLAND — A Richland pet store owner has caught the attention of national media with her plan to eat nothing but pet food for 30 days. Dorothy Hunter, the owner of Paw’s Natural Pet Emporium, with stores in Richland and Kennewick, decided to prove that pets can eat foods as healthy and delicious as human foods by consuming dog, cat and bird food each day for 30 days. She started her campaign June 19. Her decision caught the attention of producers with NBC’s Today show, which will feature Hunter in a segment that airs at 7 a.m. today on the West Coast. Hunter’s pet food diet campaign is similiar to a strategy employed four years ago by the executive director of the Washington Potato Commission. Chris Voigt ate 20 potatoes a day for 60 days. The potato diet was designed to sway the government to reinstate the white potato on the list of approved foods that can be obtained from the federal Special Supplemental Nutrition Program for Women, Infants and Children, or WIC. The program is designed to help poor mothers feed their children a more nutritious diet. Hunter’s stores carry pet food that is free of corn, wheat, soy, all byproducts, fillers, corn gluten, BHA, BHT, ethoxyquin and propylene glycol. Some of the dog and cat food brands she carries come from as far away as Italy. And, it doesn’t matter whether it’s dry kibble, canned food or treats — everything she carries in the store is carefully selected for its nutritional value, said Hunter, the owner of three dogs — a standard and two teacup Shih Tzus. And Hunter was willing to put her stomach on the line to prove her point. Her favorites are the Tiki canned cat food that’s made with succulent chicken, straight from the can, Hunter said. In the meantime, she’ll continue to eat her favorite treats from the store — dehydrated green beans. Her store opened out six years ago as a small storefront, then expanded to 8,000 square feet a couple of years later. And Hunter says another expansion is about to get under way that will add another 12,000 square feet to the Richland store. “When the expansion is done, hopefully by September, we’ll be the largest independent pet store in the state,” she said. Amanda Kempf of Richland has worked for Hunter for about nine months and couldn’t be happier working for Hunter. She, too, likes many of the hundreds of dog snacks the store sells packaged or in bulk. “My kids love the dog treats as well, and I don’t mind them eating those because they are nutritious,” Kempf said. The children also make no secret of their pet-food noshing habits. Nutrition is as important for your pet as it is for yourself, Hunter said. “If I can’t eat it, I won’t sell it because animals are important to me,” she said. The Richland store is at 1420 Jadwin Ave. The Kennewick store is at 6713 W. Clearwater Ave. Both stores are open from 9 a.m. to 7 p.m. every day. They will close at 4 p.m. July 4. A Richland pet store owner has caught the attention of national media with her plan to eat nothing but pet food for 30 days. Gaithersburg is encouraging its residents to take photos of their family pets and enter them for a chance to be declared “Citizen Pet of the Year.” Cats and dogs entered must have a current city of Gaithersburg pet license. All qualified photo entries will be posted on the city’s Facebook page at facebook.com/gaithersburgmd.gov, were voting will take place. The photo with the most number of “like” will be named the city’s “Citizen Pet of the Year,” and will receive a $75 PetSmart gift card. Second and third place winners will receive a $50 and $25 PetSmart gift card, respectively. The submission deadline is July 21. Voting will be from July 24 through Aug. 22. For complete contest rules, entry form and pet license application, call 301-258-6310 ext. 2324 or visit gaithersburgmd.gov. NEW YORK, May 28, 2014 /PRNewswire/ — The pet care industry has experienced some of the fastest growth rates in any industry, both in the city and in the nation. According to the New York City Economic Development Corporation (NYCEDC), they estimate New York’s pet population to be 1.1 million – with dogs in the lead at 600,000 and cats at 500,000. They further estimate spending in this industry in New York City exceeded $1.5 billion or roughly $1,350 per pet1. According to John Ziegler, dog expert and founder of Biscuits & Bath, a total wellness destination for dogs, he understands firsthand the unique and changing needs of the Manhattan dog owner, and their cherished pet. Today, the company announces the opening of its ninth Biscuits & Bath location in Sutton Place, located at 1064 First Avenue, providing more Manhattanites with access to expert knowledge and a full suite of total wellness services the company offers: Day Care, 24-Hour Care, Dog Walking, Grooming, Training, Veterinary Care and Transportation to and from any of its locations in order to have any client need met. As the innovator in the industry since 1990, Biscuits & Bath is constantly raising the bar for how to care for dogs in a manner that is healthy and safe, and of course, fun. Today, Biscuits & Bath is the only service provider with dedicated on-site veterinarians that can attend to monitoring ongoing wellness needs and immediate medical needs. Its services also include on-site trainers that integrate dogs into the daycare environment and monitor the dogs’ behaviors as they evolve, along with dedicated dog walkers that ensure safe walks in the urban jungle, and locations equipped with hospital grade air purifiers that kill 99.9% of all airborne bacteria and viruses. With this comprehensive suite of services, Biscuits & Bath takes pride in providing custom-tailored care for every dog. “We truly love being a hub of all things dog-related in each neighborhood we serve, and even better, we have had people in the community meet their future spouse in our puppy playgroups. What could be more fun than that?” John says. Biscuits & Bath is offering all first-time clients a complimentary day of Dog Daycare at the new Sutton Place location. Also, all membership fees, up to a $275 value, will be waived for any Dog Daycare package purchased in May or June. Biscuits & Bath Sutton Place is open Monday–Friday, 8:00am–7:00pm; Saturday, 9:00am–5:00pm; closed on Sundays. If for any reason a service is not available when needed, Biscuits & Bath will extend a complimentary shuttle to and from the Sutton Place location to one of its other eight locations that has availability. For more information, including membership packages, services and pricing, locations and hours of operation, please visit biscuitsandbath.com. If you would like more information on the New York City Pet Care Market, or would like to schedule an interview with Dog Wellbeing Expert John Ziegler, please contact Tami McCarthy or Jillian Chertok at 212.750.5755 or email: Tami@tmgpr.com. Biscuits & Bath was started when company Founder and President John Ziegler followed his dog walker one spring day in 1990 to see if his dog was enjoying the beautiful day and playing in Central Park, as promised. However, what John discovered was that instead of frolicking outside, his beloved dog was being confined to his dog walker’s small apartment. It was then that John decided there had to be a better way. Biscuits & Bath is the total wellness destination for dogs. We seek highly educated and skilled professionals with deep experience in developing needs-based relationships with clients over an extended period. Our mission is to work with our clients to positively impact the quality of life for each dog we serve. We offer expert guidance and a full range of services including: Day Care, 24-Hour Care, Dog Walking, Grooming, Training, Veterinary Care and Transportation for all NYC Dogs. Biscuits & Bath services are rendered under the supervision of our veterinary partners, NY Vet Practice. Biscuits & Bath is the most fun your dog can have without you! For more information please visit biscuitsandbath.com. • Can I make a long-term commitment to this pet? • Will I be able to spend enough time with a new pet? • Am I prepared for the cost a new pet will bring? • Which pet is right for my home and my family? As I strolled through the grocery store last month, I noticed that the Christmas décor was already up. In my mind, it was still summer, but apparently the good folks at my local fooditorium wanted to ring in the holidays a tad early this year. Some day, I am certain they will start putting up the tinsel in June. The holiday season is one of togetherness, and pets are increasingly a big part of the holiday festivities. During this otherwise joyous season, a few pet dangers are lurking, though. This info will help keep your pet safe during the fun and avoid expensive trips to the pet ER. The biggest holiday threats to pets come from the same threats to your waistline and chances of you fitting into your skinny jeans – food! The holiday season is all about food (yeah, and love and family and all that other stuff, too), and there’s plenty of it to be had: cookies, roast beast, puddings and more cookies. To you, it may just mean another hour on the stair stepper, but to your dog, human food can cause real problems. Vomiting and diarrhea are common side effects from eating too much people food (the medical term we throw about is “dietary indiscretion”), and in some cases, this can proceed to a more serious condition called pancreatitis. Pancreatitis is inflammation of the pancreas, the gland that makes digestive enzymes as well as insulin. When the pancreas becomes inflamed, it releases these enzymes and begins digesting itself. This can be a serious and painful condition that often requires hospitalization. It is probably a good idea to either keep pets confined during any holiday parties, or make sure guests (especially kids) know not to give treats to your pets. Dogs and cats have been known to drag an entire turkey off the counter when the owner’s back is turned (you know they’ve gotta be thinking “Score!”), so make sure you stay aware of their whereabouts during meal preparation. If you do want to include your pet in the meal and fun, stick to a bit of lean turkey and low- or no-fat veggies (no onions, though, as these can cause anemia in dogs and cats), and skip the gravy, dressing and pecan pie. Sugar-free items that contain xylitol are also toxic to pets. It is true: Don’t get your Doberman drunk during the holidays (or any other time), and don’t let any lampshade-wearing guests try to give your pug a mug of beer. And no one wants to see a basset with a hangover. Your dog or cat’s liver is not equipped to process alcohol, and even small amounts can be life-threatening. Put boozy party leftovers well out of reach. That includes whisky-soaked fruitcakes, trifles laced with liqueurs and the rum balls that Aunt Martha sends every year. People come and go much more during the holidays than other times of year, and all that traffic can lead to plenty of opportunities for escape. In the ER, we see many pets who made a break for freedom when Uncle Floyd came a-callin’ with his special tuna surprise. Dogs and cats can dart out the door without anyone even noticing, and there’s a whole big world of hurt just waiting for them out there. Ensure that pets are safely put away when you are expecting guests, and make a nightly head count to make sure that all the furry family members are accounted for before turning in for your visions of sugar plums. Here’s hoping you have a sane season, and that all family members make it through safely, no matter how many legs they have. As days grow shorter and temperatures begin to drop, your pet’s coat is undergoing changes in preparation for winter. The “big shed” in spring prepares Fido and Fluffy for a lighter summer coat. In fall the cycle is reversed — the summer coat will be replaced by a thicker, more protective coat. The degree of shedding varies greatly by breed, but all dogs and cats tend to lose fur at this time of year. My Newfoundlands shed year-round, but the major “blowouts” occur in April and September. Regular grooming helps prepare the coat and skin for the harsh weather ahead. That dead hair needs to come out one way or the other — better on a brush than your clothing and furniture. Plus your pet will feel and look great. Imagine if you didn’t brush your hair for weeks how icky your scalp would feel. Now imagine your whole body blanketed in fur. Healthy coats require frequent maintenance and a nutritious diet. Skin needs to breathe so that healthy fur and hair can regrow in a clean, mat-free environment. Entrusting coat care to an experienced groomer with a gentle touch reaps many benefits, including your pet accepting the hands of strangers. Grooming at home has its rewards as well — you’ll save a few bucks while contributing to the health and happiness of your beloved furry. •Thoroughly brush and/or comb your pet once a week. Brush against the grain close to the skin to remove dead undercoat and loose guard hairs. Well-brushed thick coats require less frequent baths. •Don’t forget belly and chest areas when brushing out, not just the back and sides. •Perform a total hands-on exam for sores hidden by fur or mats buried in areas such as armpits or inside of back legs. •Bathe dogs before November, then every 6 to 8 weeks, depending how dirty the coat gets. Cats rarely need baths — their bristly tongue aids in removing dead hair — provided kitty can reach all parts of her body. If you find mats on her back, cut them out. •Use a quality, gentle shampoo formulated for pets best purchased at your local pet supply store or grooming center. Never use human shampoo on cats or dogs. Avoid pet shampoos with a strong fragrance. •Apply flea preventive throughout the winter. One warm day can wake up pesky fleas and ticks. •Trim nails and foot hair short, including hair on the bottom of paw pads which can trap debris including painful snow and ice balls. Long nails can curl into paws. Trim every couple of weeks. Most grooming salons, including Happy Tails, have a walk-in nail trimming service. •Keep coats a reasonable length in winter, but not TOO long. Breeds such as Shih Tzus, Lhasa Apsos and other silky haired dogs should still be trimmed or the coat will matt. You don’t want to have to shave your dog down in the middle of winter. •Basic tools for home grooming: a slicker brush (for specific coat type), wire brush, metal comb, shedding blade, nail clippers, curved shears and small-toothed comb for flea checks. •Clean ears with an otic cleanser once a week. This task is often overlooked during the winter months which can lead to ear infections. •Above all, make grooming time a “happy time.” If your pet runs at the sight of a brush, somebody is doing (or has done) something wrong. Relax, put some tunes on, and take this special time to bond with your pet. My Newfies can’t wait to be groomed — because I make it fun! Thus, grooming is not a chore, more a labor of love, as it should be. Karen Steinrock is a pet columnist based in Grantham, Cumberland County. Send questions, comments and a photo of your pet to Karen at ksteinrock@comcast.net or to P.O. Box 306, Grantham, PA 17027. Please include your hometown and phone number.